Ahhhhh! Delightful children of Albion! Welcome, welcome, welcome to my chronicles! I am Ledoux, the ordained Chaplain of Caerleon Security! It is my great pleasure and honor in life to spread the ideals of the Sanguine among you all so that you might find your way to the Elysium. It is a way of life, my dears! A way of life which celebrates joy and death! A strange thing to celebrate, no? Of course it is a thing to celebrate, dears! When was the last time you had a morsel of grilled fish? Carrot soup? Such fine cuisine comes at the cost of the death of a plant or animal. Is this something sad? Hardly! They are satisfied and have fulfilled their purpose as living beings! Their energies are carried across the vast horizons of this world and into the Elysium where they can stay in a state of safe satisfaction. Such is also the fate of humans! The way of the Sanguine brings joy to people's lives that they may be able to cross over and live in their own version of serenity. You may notice that, although people may be killed, their souls eventually return. This is because their purposes are not yet fulfilled. Surely, you also see this much... when a plant or a school of fish returns to the place where it was once captured. Yes... even the energies of the very stones believe they have more to offer in their existence. You do them a huge boon by harvesting them, that when they are satisfied with what they gave in life, their force can cross over into the waiting arms of contentment and fulfillment! Is it a bad thing to continue to be hungry? Hardly so. Having a continuing journey brings some to contentment without the Elysium. All hunger, however, does end up being left behind. One gets bored, or finds themselves weary from such a long time doing their work. That is their time to smile in peace and pass across. Now, then. What do we say about the undead and the infernal? It is one tragic thing that a soul be returned unto an undead body against their will. We must bring mercy upon them that they may return to the Elysium. Then we have those foul things which take delight in prolonging and corrupting the journeys of others against their will! Vile abominations of the undead must be struck down, as they tamper with the journeys of others. The infernal are avatars of misery and despair. Their elemental nature is that of grief and sorrow. They are beings who shun peace and serenity, immortals who know not slumber and rest. I consider them a lesser evil to the undead. Despite their chaotic nature, they are in their own way... natural. They are divine and not "natural" as we know them in the nature of the world. Not like the weather or trees, but... much like the energies in the arcane. Their energy force is sentient and abyssal. They are what they are as a fire elemental or an ice golem. This does not mean, however, that they deserve any more mercy. Similarly, Caerleon Security stops those who would bring grief to the journey's of others. Though it may be that the thrill of the hunt slakes their hunger, the fact that they are, in turn, hunted evens the scales. Those who do not desire to be a part of the hunt are protected, meanwhile the satisfaction of a job well done comes to those who desire to defend until they are satisfied that their work is done. The Sanguine is looking for more dedicated followers. We do not laugh in the face of death. We laugh with it, remembering the good times before being ushered into a new world even beyond the magic of Albion. I shall soon bring more intricate details in order to indulge your curiosity. Laugh in sorrow, and cry for joy, my dears! Live, laugh, love, and die well! Heavens no! It is a path. The Elysium holds many gods and forms of peace. Why, even a god of chaos and destruction has an Elysium. His domain would grant people their happiness in whatever form of eternal annihilation they crave. A god of nature would offer his people a realm of great splendor where animals and followers find their serenity. My word! A god of bobcats would bring his cats to a place where their belly is always filled with birds and deer. Smile to make certain they know not what you think. Smile, that the day will come that you will never know sorrow again. Many have been inquiring about the history behind The Sanguine Path! I am more than pleased to inform you of our origins! Many who have arrived here are from lands far from Albion, as was I! It took much study to revive the following this belief once had! In between the millennia of 'peace' after the destruction of Excalibur, the few humans who survived went to their tribes and safeguarded what knowledge they had. There was a mage whose descendants stemmed from an apprentice of Merlyn. She would become what is known in the Sanguine Scriptures as the High Reverena, Meredith. Meredith was a serene and peaceful soul who used her magic to bring her people peace in hard times. Her husband, Lorn, was the jewel of her heart. Sadly, to him, she was simply a jewel to keep as a trophy to show. Soon the Cult of Morgana began to whisper in his ear, and he bade that his beloved bride follow him. She refused, only wanting to give people happiness in this world and not conquer it. He seemed to mend his ways, and on their anniversary, he stated that he desired to meet at the beach that she so enjoyed. Meredith was completely taken by surprise when the cultists kidnapped her for Lorn's initiation into the cult. Sacrificing her to the demon realm after torturing her, her spirit was sent spiraling before her body reappeared elsewhere. ... how did that happen? Why was it that she was revived after death while some never returned? The power of her grief turned to a drive to learn as she researched the ebb and flow of life and death. She looked at plants, spirits, undead, and even the animals. They often returned after being harvested or killed, but over time never being seen again. Many of her tribe also experienced this phenomenon. She also noted that the undead did not walk the earth often until the detonation of Excalibur. It was in her theory that the very energies that dictated the path of the dead were corrupted from the act against nature. She got together with the druids to try and study the anomaly, and she came to the conclusion that the energy from souls stayed behind because they still had a reason to exist. Their will to complete their purpose tethered them to Albion. The reason many became undead, as it was theorized, was that the undead feel that they still had purpose, but had completely forgotten what it was... and in most cases didn't care to remember. Meredith wept in pity for the plight that was caused, and decided that she, herself, should find her purpose in life in order to fulfill it. It did not take her long to realize that her purpose in life was to help others find and complete theirs. A spark lit in her heart, and she felt a belonging like nothing she had felt. Making certain that all people found their calling in life, remained happy, and crossed over peacefully away from the Land of the Dead is what allowed her to create The Sanguine Path. It's edicts opposed the demonic and undead, for their existence was only there to impede the path of others. Those who had lost their minds and purpose were to be killed out of mercy. Those who had lost their minds to impede the paths of others were to be killed out of justice. Those who found that their calling in life was to help others find their path in life would become the Reverene... those who revered the Sanguine Path. There is no hierarchy in our numbers, but because Meredith was our first, she is our paragon. I digress... The interpretation of finding one's happiness, however, came into question after a decade or so. Thus started the Philosophy of the Hunt. It was the purpose of some to seek and destroy others, and the purpose of others to seek and destroy the destroyers. Those whose purpose was not a part of this hunt were to be kept out of the hunt. To emphasize the need for control, the concept of an arena was proposed to the rulers of the land, that those who find peace in war would find a refuge away from the roads. This also started a slight schism in the Reverene... those who protected destructive purposes, and those who wanted all purposes to not impede on others. It is said that the Cult of Morgana decided to sew discord. Others said it happened by itself, but the High Reverena became quite tired of the nonsense, feeling her desire and purpose falling to the wayside. She chose a handful of Reverene who could stay neutral to the belief to continue her wishes. Feeling that the continuation of the Path had fulfilled her purpose, she passed to the Elysium. Several centuries passed before the mist lifted. It gave what few remained of the Reverene a beacon of hope, allowing people to discover themselves. It was then that they met a poor bumbling healer named Ledoux. ... and that story is another chapter in the pages of history. Similarly, Caerleon Security stops those who would bring grief to the journey's of others. Though it may be that the thrill of the hunt slakes their hunger, the fact that they are, in turn, hunted evens the scales. Those who had lost their minds and purpose were to be killed out of mercy. Those who had lost their minds to impede the paths of others were to be killed out of justice. Those who found that their calling in life was to help others find their path in life would become the Reverene... those who revered the Sanguine Path. There is no hierarchy in our numbers, but because Meredith was our first, she is our paragon. In the northern reaches, there lived a family of farmers who had farmed wheat for generations. The only son of the previous generation tried desperately over the years to have more males. His oldest son was Barnaby. He was a big boy even at birth, but when he was barely old enough to walk, fever struck him. His endurance allowed him to survive, but years of observation would prove that his mind was a little touched from the experience. Over time, he would have five beautiful sisters that survived. Fortunately, fate was kind to him in the physical and he became a giant of a man who could pull a plow under his own power. Good old Barnaby was nicknamed "The Ox" from this feat. Alas, his mother had grown weak from all the attempts at child-bearing and his father feared the worst... the farm would lose the family name to whomever married his oldest daughter, for Barnaby's simple mind could not comprehend counting and business. The day his father expressed his frustrations about the situation, Barnaby fell into melancholy. The farmer's life made him happy, but to know that he couldn't continue the legacy devastated him. He heard of some strange monks in red and black robes who helped people to find their real purpose. He packed up his things and went into the big city to find the local Reveren. Even among the knights and the warriors who traded with others, he was a massive sight to behold. He found the Reveren in the tavern where he often would tend to the moping drunks and the adventurers looking for work. The Ox inquired: "If I can't take care of my kin, what is my purpose?" The Reveren replied; "Find what you naturally do best, and do it in every circumstance you can think of until something sticks and captures your heart". The Ox looked at his muscles and went on a long journey to apply his strength to many trades. What was natural to him allowed him to lift much more than the average man, and the people became fascinated with his feats of great strength. He could carry several backpacks filled with rocks for the mason. He could arm-wrestle with the most powerful of warriors, and this gained him the love and attention of many. Despite this, he was a humble soul, eagerly searching for his meaning in life. This humility earned him the trust of many, and the ire of the suitors trying to woo his sisters. When his youngest sister came of the age of womanhood, his strength was needed to intimidate those who didn't have the best intentions for wedlock. The Ox and his five sisters became a local legend, and many who desired to take one of the lovely maids for themselves were found for a rude awakening. During those years, however... he learned to understand the needs of his sisters and could give them sound advice. For being around people for so long, he learned from experience who his real friends were. 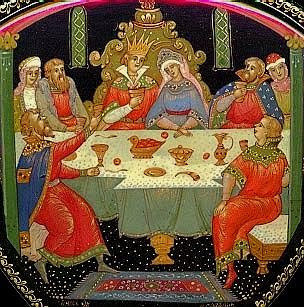 One day, during a feast with the king, it was announced that the princess would be married off to a Duke from a far off land despite having a previously accepted relationship with a hero who had vanquished a powerful demon. The Princess screamed and wept bitter tears, refusing to come out of her room in the castle. The Duke had money that he could give to the kingdom, but she was happy with the hero. It left a sour mood on the city. For some reason, though, Barnaby felt like he could just talk this out with everyone to see if there was a decent solution. Because of his heroic status, the Princesses hero allowed him to enter with a gift basket of necessities for a female to feel better. Devouring the bonbons she had a great outlet as Barnaby simply listened with the hero standing in the room to get what wisdom he could. While he was not the most educated, he did come up with a great solution. Have an arena battle between the Duke and the hero in order to fight for the Princesses hand and charge the citizens to see the battle unfold. The money would come to the city with or without the Duke winning, and he had faith in the hero to win the battle over some rich fancy pants. The fight was a success and the Duke lost the match. Word spread that it was good ol' Barnaby who came up with the plan. Soon damsels and suitors from all walks of life sat down to listen to his advice on taking care of others. Because of his simple nature, he was easy to understand. So much so that the Duke apologized to Barnaby for his anger. In return for treating a woman's heart as a business transaction, he offered to court one of Barnaby's sisters. He would truly not get anything out of things for marrying a commoner, but he would do things the old fashioned way and win their heart. It was the middle sister who earned the Duke's heart, being fond of science and knowing diplomacy from having to work with her younger and older siblings. During their lavish wedding, Barnaby had realized something. While he had muscles and knew his strength, though exercising that strength, he learned how to take care of people and teach others to do the same. He soon became an advisor to merchants and nobles alike, teaching them about cherishing people and their relationships with them. Over time, he lost some stoutness in his shoulders, but also managed to match his sisters with people who cared for them. He, himself, married a priestess who encouraged him to heal others mentally and not just physically. Seek and ye shall find, though what you find may not be obvious. Who you are and what you do are always the beginnings of your purpose. Do what you do best, and apply it until your heart sings. What you started with may not always be with what you finish with... The Sanguine Path twists to the tune of those who walk it. Those who seek their heart and calling with diligence will be rewarded with inner truth. You manage to pay the fare for the ferryman to take you to a specific island. After reaching the dock, you find a charming house with a couple of fireplaces near the road. To the right, there is a small cabin being worked on by a couple of workers. On the edge, a woman with long white hair and a fisherman's outfit. She watches a bob on the water with several fish wandering around in the water. She watches the fish intently and she finally gets a bite. A grin comes across her face as she starts to pull and yank, fighting with the fish. Taking the fish, she pulls in the line and looks at its size with interest. "Aaaahh... Do not worry, my friend! Your purpose will be fulfilled soon enough. I will make certain that your existence will be one with a hungry soul." The woman looks at you before putting the fish in the backpack behind her. She smiles, slowly folding up the rod. She leans back and assesses you fondly before taking off her hat and bowing. "I see you have found my humble abode! Yes, I am Reverena Ledoux! Yes, yes... there is a human being under the mask!" She takes out a line of fish from her backpack and motions you to join her as she walks to the chef's hut not far from the main road. The chef blinks at the both of you for a few moments as he sharpens his knives. He wears a chef's uniform, but has a red ribbon tie around his collar. "Francis! We have guests today! We will be having grilled fish and carrot soup!" Francis nods and offers Ledoux one of the grills. She smiles and takes out a bundle of carrots as well as some fish. Taking a pan, she seasons it with oil and puts it on the hot iron grill, letting the oil sizzle. She hums a tune and tilts her head as she cuts up the carrots on the cutting board. "So you have come to see the Reverena on an average day. Yes, yes. It is here where I make my home. As I had mentioned before, I was quite a bumbling healer. I am still in training to be useful on the front lines with the Caerleon Security. Until then, I tend to the morale of the soldiers, and teach them the ways of finding their own purpose. My hobbies are cooking, fishing, and working the marketplace." Ledoux takes some of the carrots and starts grilling them with the oil long before the fish is placed there, allowing the lovely aroma to fill the air. "I know you are here for two parts curiosity and one part wisdom, my dear. So I will allow you to see how the Sanguine Path is performed even in every day life! My advice is to work with intent with all things that you do. Remember that the purpose of these living things are to find a final place. Cooking, to me, is like being a funeral director. Not just for the fish, but for the plants and spices that go into things. Their energies crave to fulfill their purpose, thus each ingredient deserves the utmost respect to create works of delicious health and heartiness!" The carrots get flipped and she places several slabs of fish into the giant skillet. "This is the secret of my soup! You need to get the crisp oils from the fish mixed in for flavor. The sea gives it this appeal like chowder!" She adds some milk and some herbs, slowly bringing the fish to a grill. She makes sure a small gravy is on the bottom of the pot which slowly turns orange as she continues to keep putting slabs on and flipping them. The aroma of carrot chowder soup starts to full the air as the orange base for the soup slowly gets made. After all the fish is grilled, she adds more milk and more carrots before bringing the skillet to a soup pot. Placing the rest of the carrots in, she adds a few greens, allowing the concoction to start simmering in the pot before putting the metal lid on with a slight crack at the top to let the steam go. She cracks her knuckles and starts putting skewers on the delicious fish, garnishing the plate with a few leafy greens before offering you a taste. "I always make a preliminary batch for myself in order to get the taste of the sea in the soup. It is best hot off the grill! The soup will take longer since it is what feeds the entire crew here on the island... but these are for you and I. Now, we feast and see if I have given these creatures and plants a proper purpose!" The oil gave the outside a slight crisp, but taking a bath in that carrot gravy gave it a juicy delight! It refreshes your senses and fills your stomach. Ledoux raises a skewer to her lips and ate with gusto to see the result of her work. Taking her sleeve, she wiped her lips from eating a little too fast, some of the carrot glaze on the fish dripping from her lips. "Ahhhh... I do believe this fish may have found peace. I know I have been brought a step closer!" Ledoux offers a seat by the fireplace as the soup still simmers. Finding a nice stump, she leans back and looks at the sky. Though her hair is jet white, her complexion still looks somewhat young. She takes a book out of her backpack and checks the notes she had made before looking over to you. "Do stay awhile, my dear. I rarely have company and the Caerleon Security firm has a list of souls to show the obituary to the public! I have been in the process of building my assets, so I have been slacking. Help me figure out some witty quips for these twits, won't you?" Despite knowing her jester mask and odd quirky wisdom, the rest of the day is filled with a quiet day on an island with chirping birds and many trees. She etched thoughtfully in her book, enjoying your silent company and the life she lives in the land of Albion. Taking her sleeve, she wiped her lips from eating a little too fast, some of the carrot glaze on the fish dripping from her lips. after just finishin my lunch I can relate. Uuuuuuuugh... Pardon me while I hold my head! It would appear I started a war with the Iron Born and I was just minding my own business. Always remember, dears, never wear what you can't make yourself if you are in a place where people can kill you! Such a pity I had to lose my horse, but then I get attacked again and lose my Ox, Taurus! Pheh... yes! I was attacked twice! The second one must have knocked me out good. The last thing I recall was waking up in my birthday suit around the city. I am a bit middle-aged, so I am glad that this recent combat has kept my figure in check. Well, middle-aged for the Old World. Here I am quite young! I think I will put my energy into a proper fish fry! I enjoy fishing, and getting people some delicious food, particularly for the poor, would be interesting! Would the Storm Lord be privy to such an idea? I would enjoy a good fishing trip with the troops!